That's neat. I think I'll toy with people's heads and tell them they're all moving and I'm making the circle they're looking at stop with my mind. i feel like im on shrooms all over again! thats a summary of the emotional rollercoaster i experienced. This is really interestiiiinnngg iiiiiii waaannnttt whhheeeellss WOW! It was hypnotising me! 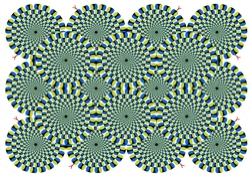 I think it wasn't moving coz when u stare at one, it stops! It just confuses your eyes! AAAAAAAARRRRRRRRGGGGGGGGHHHHHHHH!!!!!!!! Update the site already!